It’s often during their fifties or sixties that many first receive shocking news about their health. It may be they have pre-diabetes or high blood pressure. They may be diagnosed with thyroid disease or another autoimmune condition. Menopause may be tiresome and seem tireless. Or they even have serious life-threatening disease like stroke, heart disease or cancer. 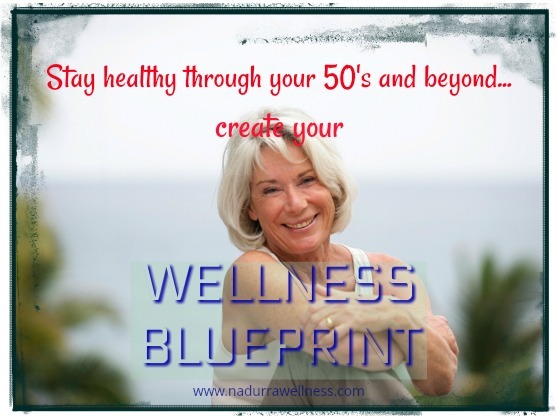 This is the age when it’s crucial to take control and create your own Wellness Blueprint Plan to keep you healthy in your fifties and beyond. But creating a Wellness Plan that fits with YOUR life can be difficult. Where to begin? What do you do when the advice on “Dr Google” seems to be contradictory? You can’t change everything at once so how do you know which changes are the most important? And what about natural remedies? There are sure to be some that will help your situation. And then there’s the issue of different advice coming from different people. What happens when your doctors and therapists are all focused on a different part of you so they all tell you to do something different? For example, you may be told you need to walk every day for your health. But what if your arthritis or foot problems make this really difficult. What if you’re recommended a diet based on foods you know don’t sit well with you? The situation can become confusing and may result in you making only minimal changes at best. For many it’s just too overwhelming and they give up before they even begin. And of course there’s the whole challenge of how you begin when you need to make dramatic changes. W hat is the very first step? I have seen this situation occur in many of my clients who are left confused, frustrated and scared. They want to make changes to their lifestyle to become healthier and reduce the likelihood of further problems. But too often they end up drowning in an overload of information. They lose sight of the big picture and sink below the details. They need the key to managing the situation. Only then they can go ahead and continue to enjoy their life. That key is to create the Big Plan which I call the WELLNESS BLUEPRINT. When dramatic change seems overwhelmingly huge it can help to break down the changes needed into small steps. If you have been told to cut out coffee or alcohol for example, cutting back gradually can make it easier. It help breaks the habit so you achieve your goal over a few weeks. Of course in the case of certain serious illnesses you need to do much more than just give up coffee. And you usually need to make the changes immediately. But by making small changes across your whole life you begin the process. Change happens in small increments in many different ways at the same time. Later changes are much easier to make because you’re already part of the way towards successfully achieving them. There’s no doubt that in order to stay healthy, feel young and continue to enjoy life we must change our lifestyle behaviours and ditch bad habits. But the way you go about it will dictate whether it is easy or difficult. More importantly, it also impacts how successful you are at making long-term sustainable change. After all, if you just slip back into your old habits nothing is gained. Whether it happens immediately or not for a year or so, you’ll again find yourself back in a health crisis. The message in a health wake-up call is to make changes that are sustainable. I’ve introduced the Wellness Blueprint Program to support you to create your own sustainable individual wellness plan. The Wellness Blueprint provides an overview that helps you keep perspective. To create it we take all your health requirements as well as your restrictions into consideration. Plus we can accommodate your life-style and personal priorities. The Blueprint guides you to create a prioritised plan that you can then break down into small steps. One of the most difficult aspects of making big changes to your life comes when you start to integrate them with your current life. This is the time when its easiest to fall back into your old ways. Particularly when you try to make more than one change at any given time. Just think how difficult it is to stick with New Year resolutions past February! Although you start out the year with the very best of intentions, it’s so easy to lose momentum and drop off. I support you to create a realistic plan that is aligned with your health, your lifestyle and your needs. You can work with me 1:1 or instead join me on retreat. retreats are life-changing because when you get out of your everyday environment it’s easy to focus on you. In this relaxed environment you can become supremely clear about your needs. I help you devise the blueprint to make it happen. After the retreat I support you as you begin to introduce it into your life. With support you are less likely to lose momentum and lose the opportunity to upscale your wellness and upscale your life. You gain the benefit of my experience and knowledge gained from 17 years practice to guide you. When you’re ready to upscale your health and wellness contact me to work 1:1 to create your Wellness Plan. Or sign up for the next retreat Natural Wellness Retreat for mid-lifers. You receive 7 days to focus on creating a realistic, workable, sustainable Wellness Blurprint that fits YOUR lifestyle.